To Showcase That Special Family Member! 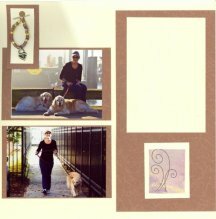 Pet Scrapbook Layouts are the best way to show that special bond to our wonderful family pets and to show them off. They deserve to be in that family scrapbook like the rest of us - or maybe they are such special animals that they deserve an entire book all to themselves. So take this opportunity for scrapbooking pets, and to take some photos of your those furry family members. This beautiful dog named Windy was one of the special ones. And she deserved an album all her own -- a very special Pet Tribute. 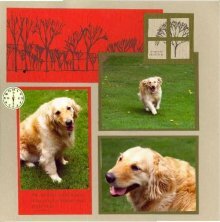 Here are a few of those pages to give you some ideas about ways you can do special pet tribute scrapbooking layouts. 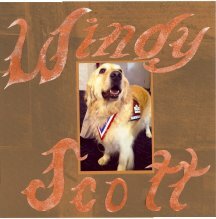 This first pet scrapbook layout page or title page, shows Windy wearing her championship ribbon for her service as a care giving dog to the community. This one photo with the medal around her neck shows not only her beauty but the recognition she has received for hard work and loving kindness as well. Windy is a Canine Assistant and was honored as 2007 Animal Hall of Fame Inductee in Alpharetta, Georgia. While this title page looks detailed, except for her name, it is very simple. Her name is hand drawn and cut, inked with copper colored pigment ink and then the individual letters were partially embossed. In real life the name resembles hammered copper. There is no doubt who this book is about. The single photo is matted on a copper metallic paper. All papers are from the Club Scrap Color in Black & White kit. Here is a 2-page Scrapbook layout showing some day to day activities as Windy and Cricket are being walked by their owner. The theme here is: Ordinary things make for special days. This 2-page spread is done with elegant metallic pearl paper. The beaded embellishment in the same brown tones as Windy's coat has a heart charm and resembles a fancy collar. It is mounted almost as if it was a small photo on double mattes. Journaling Block: The journaling box on the upper right says "The best things in life are unexpected", like the fun of a daily walk with a special companion or two. Although this is an outdoor layout, the papers are quite formal and elegant. But that's the feeling I get when I see photos of Windy. In fact, these photos were so special, I had them specially developed by MPix.com on the Kodak Endura Metallic paper. Endura Metallic features a unique pearlescent surface resulting in stunning tones, sharp details and beautifully saturated colors with impressive three-dimensional images. Journaling Block: The lower journaling box says "Those who live passionately teach us how to love. Those who love passionately teach us how to live". From what I understand about Windy and her owners, this is a perfect fit. 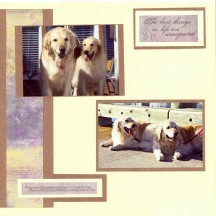 A perfect pet tribute scrapbooking layout. All papers and embellishments here again come from a Club Scrap kit for September 2007 called Be Still - specifically the Pearl Print and Pearl Plain text weight paper while the mattes are the Brown Plain Card Stock Paper. There is an open 4 x 6 inch photo matte which the owner of the book can put journaling on, another photo, or maybe some information about one of Windy's jobs. 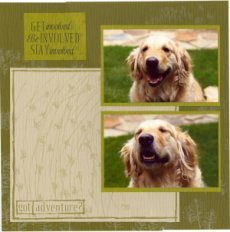 These Pet Scrapbook Pages show a playful Windy as she runs outside and plays hide-and-seek in the shrubs and behind the fence. Clearly, she has done this often. The little Clock Face/Compass embellishment indicates, to me, that it's time to be outdoors. I don't know where I got it, and may never find another one, but it just seemed to fit the idea of this layout. This spread uses an outdoor theme with patterned and textured background paper and embellishments pieced together to show some red coloring to contrast with the brilliant green of the grass and shrubs. Remember the complimentary colors from the color wheel on the Pick Your Colors page from the Quick Start Guide. 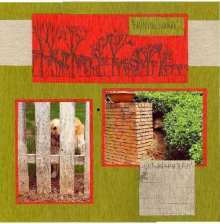 All products for these Pet Scrapbook Layouts are from the Great Outdoors Kit (October 2007) from Club Scrap with papers in Mushroom, Red Print, Light Green and Dark Green with several journaling blocks from the embellishment kit. Journaling Blocks: The Red journaling block under the photo says "Now and then it's good to pause in our pursuit of happiness and just be happy." The tree in the upper right hand corner says "Welcome to the Great Outdoors." The green journal block says "Enjoy (everything)" while the mushroom journaling block with Windy hiding, says "Got Adventure?" with some additional space for the owner to make her own comments. 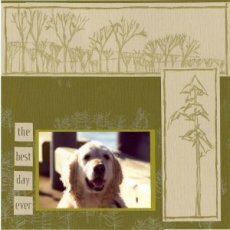 One last set of Pet Scrapbook Layouts: Windy - The Best Day Ever! Journaling Blocks: The Light green journal block says "Get Involved, Be Involved, Stay Involved". It fits Windy perfectly. The Title - The Best Day Ever! is actually 1 inch squares of the mushroom colored paper printed with one word per square. They don't have to be at the top of the page to be a title. Scrapbook Supplies Used: All papers were also from the Outdoor Kit from Club Scrap. The background papers for both layouts were dark green, the Mushroom pieces were all cut from one patterned piece and placed on the two layouts. The photo mattes were each 4 x 6 inches from 1/2 sheet of the lighter green color. Total 12 x 12 pages used 3 and 1/2, plus the little title squares. Ultimately, your Pet Scrapbook Layouts are just like your layouts for anything else. Even the journaling can be the same. I tend to pick my papers based on colors first - to go with the photos, and then try to add something to make the texture and embellishments fit with the theme and context of the photos. Hopefully we have been able to give you some great pet scrapbooking ideas to use along the way to document that special furry family member. in her role as a Canine Assistant and to learn more about the organization.